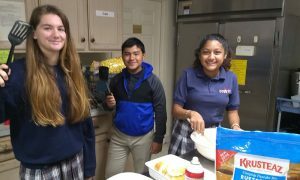 On Friday mornings before school, at 7:30 am, 7th and 8th graders gather for a pancake and eggs breakfast, juice, tea, or hot chocolate! About 8:00 we gather for a fun game – usually with a Bible theme – for a few minutes. Once we settle down we read and share aloud about a particular Scripture verse for the day. What a fantastic way to end the week and thank God for all of his blessings! 7th and 8th grade parents volunteers are needed with the cooking and setup. And students need to fill out the Extra-Curricular Activities permission form to participate. This schedule is subject to change. Parents and volunteers are notified via email each week of any schedule change.